No matter the size of your garden, keeping the grass cut is important if it is to look its best. But mowing the lawn can be a little like vacuuming: a mundane chore that none of us wants to do. However, with the right equipment, you can have your garden looking neat and tidy in no time. 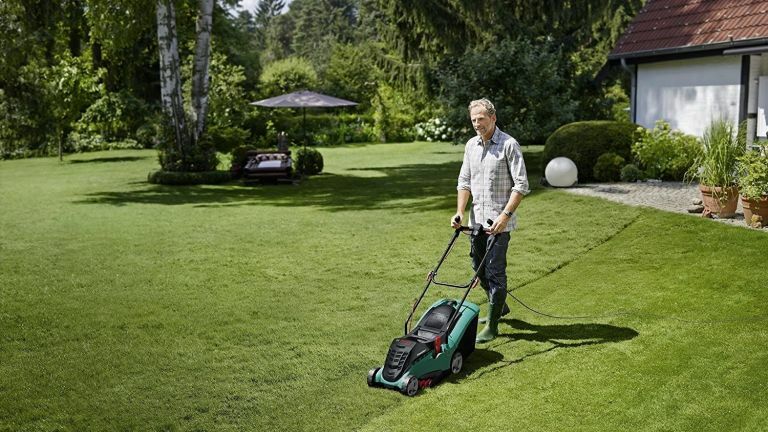 We've hunted down the best lawnmowers to help you keep your garden in tip top condition. Don't miss our guide to how to mow a lawn (yup, there's a technique) to get yours looking perfect, and visit our gardens hub page for advice, more buys and design ideas. So, how to choose the right lawnmower? First, consider the size of your garden. A small garden can easily be tidied with a hand or push mower, with you doing the legwork. Larger gardens may require something more industrial to get the job done quickly and efficiently, in which case petrol motors are the way to go. Different lawnmowers cut the grass in different ways, with some being more effective than others. A cylinder mower uses a rotary blade to scissor the grass, which works pretty well on small areas, but as soon as it rains, you’ll find it tougher to cut the grass with this type of lawnmower. Hover mowers are a little more robust and can cut their way through uneven patches of grass with ease. Some collect the trimmings in a bag for you to empty just like a vacuum, or you can opt for one that simply redistributes the cut grass which will save you the hassle of taking it down the tip. Now you have an idea about what’s best for your garden, take a look at our top picks for lawnmowers that will keep your garden looking tidy all year round. Everyone is raving about this robot lawnmower and when you get one it will become part of the family. This lawnmower will automatically cut your grass and then return to its charging station when it needs more power. It features collision sensors which allow it to navigate around your garden while you sit back and relax. You’ll never have to worry about mowing the lawn again. This little push mower boasts no frills but if you only have a small garden then this really is all you need. It has a 5 bladed cutting cylinder and an adjustable cutting height then all you need to do is push. A hand mower like this one could be a little too small for larger gardens but it is low-maintenance, lightweight and easy to use. This powerful petrol-fuelled lawnmower is the perfect size for medium gardens and can cut grass with precision right up to the corners of your garden with extendable grass combs. Although a little big, it is easy to push and is adjustable to the cut height you require. The Bosch Rotak 40 is easy to set up and go at the push of a button, with no faffing with assembly required. If you like the look of the Bosch Rotak but don’t have the storage space, then the Flymo HoverVac 280 is a great alternative that comes in at a fraction of the cost. This is one of the best hover lawnmowers and it folds down neatly to store in your shed or garage. It only has a small grass box but it compacts it down so you don’t have to empty it as much and for small gardens this mower is the perfect size to cut your grass quickly and efficiently. The Gtech Falcon is perfect if you've got a large or oddly-shaped garden as it is entirely cordless making it much easier to manoeuvre around hard-to-reach areas without getting all tangled up. Customers love the driving force behind this mower and find that it provides a seamlessly smooth cut that makes mower the lawn more of a pleasure rather than a chore. It's got a large grass box which is easy to remove when finished, although it can get a little heavy if you leave it to fill right up. If you're looking for a mower with a bit of oomph, you can expect the Gtech Falcon to provide excellent results every time.